Just wanted to highlight a few products that are new in the store this week! - Glue Glider Pro- a fantastic glue runner tool that is the perfect combination of heavy duty and cute. In hot pink & lime green, this tool is a joy to work with- comes with 40 feet of 'perma tac' adhesive (guaranteed to stick & stay put!). The bonus? It's super easy to refill, and the price is better than you'll expect! - Simply Handmade- new release magazine by the makers of Scrapbook Trends- this Dec/Jan issue includes 50 fun projects you can make in an evening and lots of great ideas for Christmas. 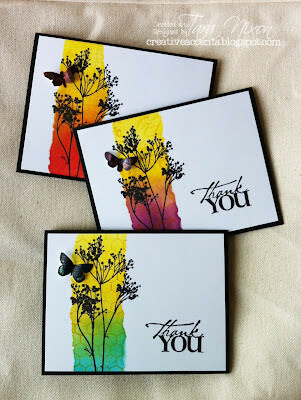 Simply Handmade is replacing "Paper Trends" and now includes projects with other mediums (ie. fabric) as well! - Clear Dollar Stamps- we're not sure of the reason for the name, but this new line of Clear stamps we're carrying is really cute! There's lots of great designs (including "Charlie Horse" and the cutest squirrel...) and the quality is really impressive! 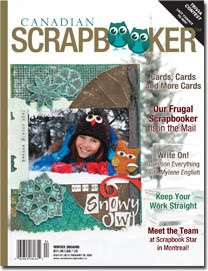 - Canadian Scrapbooker- the winter issue has arrived and it looks like another great one (it doesn't hurt that there's an owl on the cover layout)! This issue includes lots of card ideas, great layouts and home decor ideas... and lots of great tips & techniques! - Armour Etch- glass etching is soooo much fun, especially when combined with the QK Silhouette & Holly gift set! Etching creme is in stock now (and sources tell us our price is significantly lower than they've seen it elsewhere!) as well as a great selection of colours of QK vinyl (not that the colour matters when you're making a stencil to etch with... but you want to be able to use it elsewhere, too!). Join us for the 'Santa's Coming' class on Tuesday night and you'll get to etch a great 'Cookies for Santa' plate & try it out! - Volume 2 of Canadian Scrapbooker Basics is here! This fantastic idea book is just $7.99 and a set of Vol.1 & 2 would make an awesome gift for someone you know just getting started in Scrapbooking... but there's great ideas in here for even the most advanced among us! Sometimes we forget those 'basic' techniques we loved way back when! This issue has a focus on STAMPING and includes lots of great ways to incorporate stamps into your layouts. There's lots more new (and on it's way) but that's a few things that caught my eye today... we hope to see you in the store soon!